A quilt is a work of art that the maker has put many hours into creating. Machine quilting not only holds the top, batting and backing together, but also adds beauty to the quilt. I operate a Gammill Classic. This is a longarm machine that is hand-guided to place a design on your quilt. I have been quilting since 1982 and have had my longarm business since 2001. As of January 2014 I have completed just over 1,300 quilts for customers. 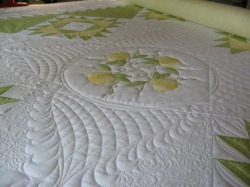 My desire is to help you finish your quilt tops with Artistic Machine Quilting. Please look through my website for more information about my machine quilting work as well as photos of some of my work. Thank you for visiting my site. ​UPDATE: I now live in Spokane WA. I still have my longarm business but I am only quilting a few quilts every year. Most of my quilting is done for people who I have quilted for in the past so I only occasionally take on a new customer. That said, you are welcome to contact me through email and see if I can do a quilt for you.